As a classroom of fourth-graders looks on, Dessie Chandler and Daniel Mendoza prepare a physics lesson. The UAB freshmen hold up two beakers of clear liquid and place a wax votive into each vessel. In one the candle sinks; in the other it floats. “Why does each candle behave differently?” they ask the Rocky Ridge Elementary School students. UABTeach students Daniel Mendoza and Dessie Chandler lead a physics lesson at Rocky Ridge Elementary School. At top: Student Kristen Bates shares a big-picture view of environmental science with campers at McWane Science Center. “The candles are different!” “The liquids aren’t the same!” “It’s a trick!” As the young students offer explanations, Chandler writes their answers on a whiteboard while Mendoza distributes water bottles and beakers of dish soap, corn syrup, cooking oil, and green food coloring. The children pour the various liquids into the bottles, watching some rise and some fall. Density is the lesson for the fourth-graders. But for the UAB students, teaching itself may be the answer—to questions about their career paths and to a problem facing K-12 schools in Alabama and across the country. Chandler and Mendoza are among the inaugural class of UABTeach, one of the most ambitious initiatives to address America’s growing gaps in science, technology, engineering, and math (STEM) education. Simply put, the nation’s K-12 students don’t have enough qualified teachers to prepare them to fill increasing numbers of STEM-related jobs. Surprisingly, about two-thirds of high-school math students and one-third of high-school physical science students have teachers who did not major in the subject, or who are not certified to teach it, according to the National Math and Science Initiative. It’s a problem that casts a long shadow, impacting students’ chances of entering and succeeding in college in addition to their career choices. There are global implications as well, as the United States fights to keep a competitive edge in knowledge, innovation, and economic growth. Finding new teachers to reduce the shortage hasn’t been a fast or easy process. Traditionally, college students pursuing that path have had to earn an undergraduate degree in a STEM major, and then supplement it with additional years of training to obtain teacher certification in their subject. UABTeach quickens the pace by streamlining the educational pipeline. First, the program targets people already passionate about STEM subjects—young college students considering careers in health care, scientific research, engineering, or similar fields. (Mendoza is majoring in biology; Chandler is focusing on materials engineering.) Then it makes an enticing offer: They can receive both a STEM degree and accreditation to teach junior high or high school—all without pushing back their graduation. That’s preparation for two careers, with significant savings in time and tuition. For schools, the program helps to identify a new teaching force of highly qualified STEM instructors. 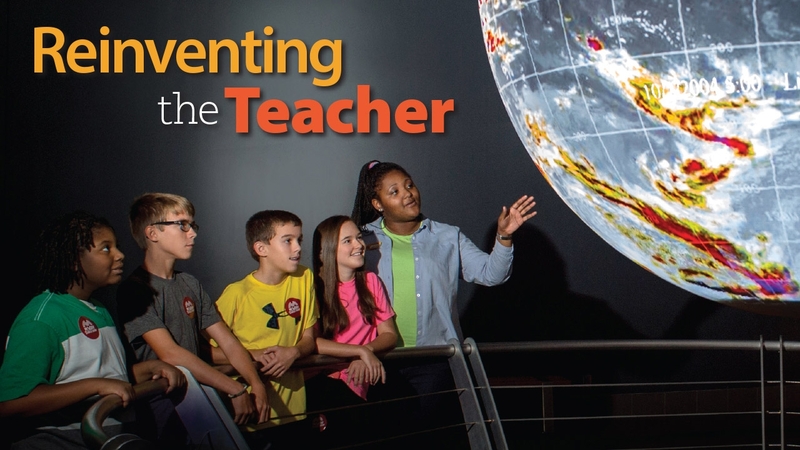 “UABTeach is a revolutionary approach to recruiting math and science students into the classroom,” says Amy Morgan, Ph.D. She plays a role in that revolution as one of the program’s master teachers, who bring extensive classroom experience—25 years for Morgan—to introductory classes and field training. These experts become a source of strength, sharing valuable advice and tracking progress as students take their first steps toward a teaching career. “Our students will graduate with both a deep knowledge of their subject matter and a strong foundation in pedagogy,” Morgan says. A UABTeach stipend gave student Alexis Helton opportunities to continue teaching science over the summer. Here, she talks turtles, birds, and other animals with young campers at the Birmingham Zoo. UAB is an ideal home for the program—the only one of its kind in Alabama—because of UAB’s world-renowned research, top-tier STEM departments, a strong teacher-training program, and established community ties. “Birmingham was ready for us to implement this model,” says program co-director John Mayer, Ph.D., associate chair of the Department of Mathematics. “Alabama is desperate for science and math teachers.” Lee Meadows, Ph.D., associate professor in the Department of Curriculum and Instruction, also serves as co-director. The program is based on UTeach, which began in 1997 at the University of Texas at Austin to better prepare and increase the number of certified STEM teachers. Its success led to the 2006 establishment of the UTeach Institute to expand the program nationwide. Currently, 44 universities throughout the country are implementing UTeach programs; as of spring 2014, more than 2,000 students had graduated from these programs. UAB’s version, a collaboration involving the School of Education, the College of Arts and Sciences, and the School of Engineering, exceeded expectations right out of the gate, enrolling 70 freshmen and sophomores in its first semester last fall. More than half of those students continued into the program’s spring courses, supplemented by 36 new students. This fall, approximately 125 students—including about 80 incoming students—have enrolled in UABTeach. Nationwide, 87 percent of graduates from UTeach programs have become teachers. Of those, 76 percent are still teaching five years later—with more than half working in economically disadvantaged schools. The UTeach Institute predicts that, by 2020, more than 8,000 UTeach graduates will be instructing 4.8 million secondary-school students. Bates talks about ancient sea turtles with campers during her summer at McWane Science Center. For most students, UABTeach means they can pursue two passions. “I had played with the idea of becoming a teacher, but I didn’t think I could do that if I went to school to become an engineer,” says Tyler Rhodes, an electrical engineering major from Pinson, Ala. “When I heard about the UABTeach opportunity, I took it.” The program also helps some students silence a nagging worry: What if I don’t get into medical school? Mayer, Meadows, and the master teachers now spend their summers talking with incoming freshmen about the possibility of a teaching career. “There’s something so great about having options,” Meadows says. As an incentive to students, the program’s introductory Step 1 course counts as a required first-year experience (FYE) course in the College of Arts and Sciences. (Students in the School of Engineering complete a separate FYE course.) Upon successful completion, all students are reimbursed the course’s tuition. If they move on to Step 2 in their second semester, then the cost of that course also is reimbursed. Step 1 dives into the “5E” instructional model: engage, explore, explain, elaborate, and evaluate. In other words, students learn to develop interactive math and science lessons that build knowledge on top of experiences to reinforce concepts. These educational activities must engage learning by connecting a new concept to previous experiences and allowing learners to actively explore the concept. The UABTeach student will then explain the concept, encourage learners to elaborate on what they have experienced, and ask them to evaluate their understanding of the concept. Master teacher Paulette Evans leads an introductory course for UABTeach students. Jan and his classmates struggled through two lessons before finding success when the topic turned to photosynthesis. By the end, “the students were fairly well versed in the products and reactants of something so complex as photosynthesis,” Jan says. “We even showed them how to balance equations because we felt the kids could handle it.” The practice was valuable, as was the mentoring from Avondale teachers and from master teachers Morgan and Paulette Evans, Ed.S., Jan notes. Mendoza guides a Rocky Ridge Elementary fourth-grader as she answers questions about density following her physics experiment. The air buzzes with excitement—and mechanical sounds—as a room full of elementary and middle-school teachers, working in pairs, attaches bits of plastic to tiny batteries. They are constructing a horde of small robots, and their challenge is to find the right combination of weight and stability that will allow their bots to navigate a tabletop racecourse. It’s a different kind of UABTeach lesson for a different set of learners: a group of teachers who hosted the first UAB students in their classrooms throughout the fall and spring semesters. They convened at the invitation of Evans and Morgan, who are charged with building the network of local educators willing to act as mentors and advocates for UABTeach students. The two master teachers guide the mini robotics lesson, which illustrates the program’s 5E instructional model, and solicit feedback on the UAB students’ performance and ways that everyone in the room can better serve these fledgling teachers. Participating teachers receive professional development opportunities and stipends in exchange for their time. Helton illustrates the connection between bears' teeth and their diet during her teaching stint at the Birmingham Zoo. On a muggy summer afternoon, Alexis Helton, a biomedical sciences major from Madison, Ala., leads a group of young campers through the Birmingham Zoo to the bear enclosure. There, she talks about the different kinds of teeth bears have, and the clues they reveal about the animals’ diet. Meanwhile, across town, Kristen Bates and a group of fifth- and sixth-grade students are staying cool at McWane Science Center’s Shark and Ray Touch Tank. As the sea creatures glide silently through the water, Bates, a chemistry major and Birmingham native, points out similarities between the various fish. Much as they did in classrooms the previous year, Helton and Bates give the campers a chance to explain what they are observing. Officially, the two are volunteers at the zoo and science center, but they also receive a stipend from UABTeach. The unique setup enables them, and several other students, to remain in an educational setting for the summer, where they can continue practicing their teaching skills before the fall semester begins. Grants to UABTeach support these stipends and make the program possible. Through a grant from the Howard Hughes Medical Institute, the National Math and Science Initiative provided $1.45 million to establish the program, which UAB matched. Additional gifts from the Community Foundation of Greater Birmingham, the Mike and Gillian Goodrich Charitable Foundation, the Belk Foundation, and the Max and Lorayne Cooper Foundation are helping to fund UABTeach scholarships and student programs, along with supporting mentor teachers and master teachers. Bates compares sharks and stingrays for students at McWane Science Center. The initial funding helped UAB to meet one of the UTeach model’s benchmarks, a dedicated space for the program, immediately. The new UABTeach Workshop in Heritage Hall is where students learn, plan lessons, meet with master teachers and administrators—and also connect by collaborating on projects and simply getting to know each other. That camaraderie has led the first class of UABTeach students, who will graduate in 2017, to create an organization, Future Alabama Math and Science (FAMAS) Teachers. Through FAMAS, the students provide encouragement to one another, identify opportunities to volunteer in the community, and recruit more students for UABTeach. “Students walking into the UABTeach Workshop should feel at home and know that someone is there to help, someone will always guide them, and that they have a family,” said Jan, who is president of FAMAS. Master teacher Amy Morgan shares classroom insights in the UABTeach Workshop. Rhodes, the group’s vice president, hopes the links forged through FAMAS will entice his classmates to learn more about each other’s favorite subjects in the sciences, math, engineering, and more. The diversity of knowledge among the students “allows members to experience things they might have never seen or done if they had passed on UABTeach,” he says. Ultimately, those bonds help power the program’s success, Mayer says. UTeach students at UT-Austin consistently have high grade-point averages and tend to graduate in five or fewer years. Mayer attributes those outcomes to the program’s cohort feel, along with financial support for students. “The sense of fellowship among students is one of the secrets to the on-time graduation rate,” he says. • Get more details about UABTeach and learn how to enroll in the program. • Give something and change everything for UAB students advancing STEM education—and the K-12 students they will serve. Chandler helps a fourth-grader at Rocky Ridge Elementary discover the wonders of physics.